VackerGlobal has been providing various products and services for Cold Chain Management for ensuring GDP (Good Distribution Practices) and GMP (Good Manufacturing Practices). 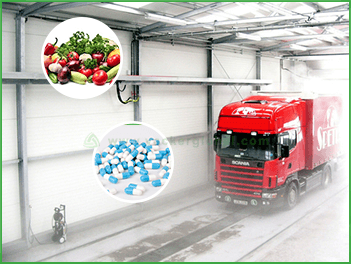 Cold Chain management relates to various stages of handling of temperature sensitive goods. Food and medicine are the main types of goods covered under the subject. However, medicines and vaccines are the most important. Our products are applicable for all segments having temperature controlled environments. We are listing hereunder our various products and services for GDP (Good Distribution Practices) and GMP (Good Manufacturing Practices). Numerous variations of each product range are available and you may contact the nearest office of VackerGlobal for more details. 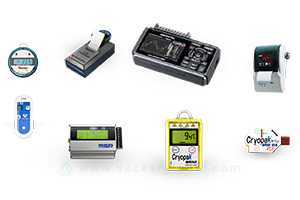 We have hundreds of different models of data loggers for recording temperature, humidity, pressure etc. These are electronic recorders for recording the temperature and humidity for a number of months. We have data loggers which can record from -200°C to 1500°C for various applications. There are models with different kinds of sensors, memory capacity, accuracy etc. There are loggers with a battery as well as with regular electrical power supply. We have loggers which can continuously record for a number of years. Real-time monitoring systems are for recording and displaying any parameter over a central computer system. The parameter can be temperature, humidity, pressure, air quality etc. You can select the required parameters based on your application. AS an example a clean room will require all of the above parameters. There are various transmission technologies available such as Ethernet connection, WiFi connection, Bluetooth connection, Radiofrequency connection etc. Each of them has different advantages and disadvantages. Our experts will help you select the right ones. The trucks or vans transporting temperature sensitive goods require temperature monitoring and recording systems. The location of the vehicle may not be very important from a GDP point of view. 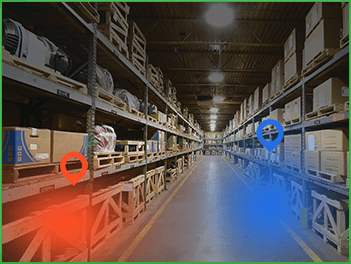 However, for logistics purpose, it is desirable to monitor the location as well. Hence there are many vehicle monitoring systems which combine the monitoring of location, temperature humidity etc. Also, there are monitoring systems available with printers. The driver can give a print out of the recorded temperature for a certain duration. Humidity control is very essential during the manufacture and storage of many medicines as per GDP & GMP. Many medicines should be stored in a cold room within a humidity of 65%RH. In order to control humidity, you will need to use Dehumidifiers and humidifiers. Dehumidifiers are for reducing the humidity. Humidifiers are for increasing the humidity. In order to decide properly, we recommend recording the humidity for a couple of days. With these data, we will be able to recommend the best solutions for your needs. We provide complete cold rooms and freezers for all types of applications. 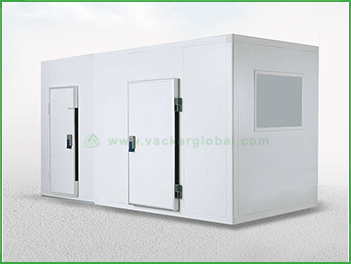 These cold rooms are for the storage of medicines, vaccines, fruits, vegetables etc. We have two types of cold rooms. The first type is the conventional types of cold rooms with chiller units. The second type of cold room is an economic version of cold rooms which are much cheaper in capital cost and operational costs. You can also convert an existing room into a cold room utilizing the second type mentioned above. We will require the size of the room and the required temperature to design a cold room. Temperature mapping study is a series of tests to test the performance of storage areas. These are generally for warehouses, cold rooms etc. Based on your type of stored goods, you may need to include humidity also in the mapping study. In such a case it is called temperature & humidity mapping study. We undertake the complete mapping study and preparation of SOP for your needs. You need to carry out the temperature mapping study at least in two or maximum three climatic seasons based on your country. Temperature qualification and validation involve more tests compared to a mapping study. Mapping study is only one part of the qualification process. Qualification and validation are mainly for assets such as cold rooms, trucks, vans, active boxes etc. Most of these assets will require testing of humidity conditions as well. The series of tests include Design Qualification (DQ), Installation Qualification (IQ), Performance Qualification (PQ), Operation Qualification (OQ) etc. If you require humidity control, you may have to use dehumidifiers or humidifiers as well. Different software used in Cold Chain needs validation as well. The validation requirements might be in line with 21CFRPart11 or it can be also as per the local regulations. We have our own software company Vacker360, which is capable of carrying out the software validation to meet these requirements. The software validation covers various stages from display on the screen to the storage to the printout, alert generation etc. We carry out the validation in line with standard software protocols. HVAC (Heating, Ventilation and Air conditioning) systems are installed in all temperature-controlled environments such as a warehouse, cold room, freezer, clean room etc. In order to ensure proper design, installation and performance, we can carry our HVAC system validation on the entire system. We can validate from the design stage. The complete validation protocol involves Design Qualification (DQ), Installation Qualification (IQ), Performance Qualification (PQ) and Operation Qualification (OQ). A Standard Operation Protocol (SOP) is a document which details all sequence of operations for compliance with GDP and GMP. More than the guidelines of GDP and GMP, this is prepared mainly based on your operations and company policies. Also, test results and findings of qualification and validation of different assets will also be part of the SOP. Different teams in your company will be following these procedures for all day to day operations. Also, it will define the actions to be taken in case of deviations etc. Pressure control and monitoring are mainly in manufacturing environments. Some rooms have to be in positive pressure and certain other rooms have to be in negative pressure. We provide the necessary design and implementation of such systems for pressure control. Also, such rooms require monitoring systems with an alert system to ensure that they are maintaining the required pressure difference. These are also known as differential pressure monitoring, negative pressure monitoring etc. Hospitals also use such systems for special rooms. The clean rooms are required for manufacturing and research of medicines, vaccines etc. The clean rooms fall under different categories based on the level of cleanliness required. Upon commissioning, a clean room requires continuous monitoring and alert system. This is to ensure that the clean room maintains all the required parameters at all times. Based on the grade it will require monitoring of temperature, humidity, Indoor Air Quality (IAQ), the presence of gases etc. We can provide any type of such systems as per your requirements. Clean rooms validation requires a detailed procedure to ensure that it maintains all the required parameters under all operational conditions. After commissioning, the validation involves the protocols such as Installation Qualification (IQ), Performance Qualification (PQ) and Operation Qualification (OQ). The whole process may take 7-10 days to complete the entire series of tests and procedures. Upon completion of the validation process, we will provide a complete report and recommendations for the preparation of your SOP. Thermally insulated blankets are for covering goods on pallets during their storage and transportation. There are different grades of thermal covers available for different temperature ranges and with different retention capacities. The pallet covers are available both for EU and US sizes. In order to decide the right type of thermal cover, you need to know the ambient temperature, the required temperature and the duration. Accordingly, we will recommend the right types of thermal covers. We provide the temperature performance curves of these thermal covers as well. Passive cool boxes are for storing temperature sensitive goods for a few days. These are thermally insulated boxes with gel packs inside the box. We have the performance reports for the same indicating the duration for which it can maintain a certain temperature. In order to select the right box, we need to know the ambient temperature and the temperature of the goods. The boxes come in different sizes. Also, we have disposable boxes and reusable boxes. These are manufactured in France and distributed around the world. Active cool boxes have a small refrigeration unit mounted on the box. They work like a small refrigerator. They can maintain the temperature as long as the electric power supply is available. Most models can take power supply from a vehicle as well as from a normal warehouse. It comes with an electric adaptor for connecting to a normal power supply. Hence these are ideal for the transportation of medicines in a vehicle. We also provide a temperature mapping study of these active cool boxes for compliance with GDP requirements. Liquid Nitrogen (LN2) is used in various clinical and research applications for achieving extremely low temperatures. These require special care and attention in storage and handling. Hence special types of portable containers and handling accessories are available for hospitals, research laboratories etc. These containers are specially tested for temperature and pressure based on the types and application. We have different suppliers from the USA and Europe for the supply of various accessories of Liquid Nitrogen. Temperature monitoring of Liquid Nitrogen cannot be done using normal monitoring systems. This is because Liquid Nitrogen is close to -200 °C. Hence it requires special sensors and monitoring system. We supply a special monitoring system for Liquid Nitrogen. It can take readings using special thermocouple sensors up to -200 °C. The device can connect to 4 different cylinders. It operates on battery as well as on electric power supply. You can either connect to a local network or use it as a stand-alone system. Climatic and Stability chambers are generally with controlled temperature and humidity. We can set the desired temperature and humidity inside the chamber. These chambers are used for various applications. Stability chambers are available from small tabletop chambers to big room sized chambers. We can provide a proper selection based on your requirements. We can provide for temperature up to 70°C and humidity up to 95%RH. If you need other ranges, please let us know your exact requirements. A Thermal validation process involves the placement of multiple wireless sensors and the collection of data. Depending on the equipment to be validated, the parameters include Temperature, Humidity, Pressure etc. For temperature, different types of thermocouples are used. The data collection can be either by data loggers or through real-time data transfer. The real-time data transfer gives the advantage of continuous monitoring and repeating the tests if required. Validation is used for incubators, different types of chambers etc. Mean Kinetic Temperature (MKT) is a calculation of the MKT value across a duration of time using a thermal constant. This is mainly applied to medicines to check whether MKT has exceeded the stipulated temperature range during storage and transportation. We have developed an Excel-based Software for calculating the MKT from the recorded temperature data. You may see our related page on How to calculate the MKT using Excel. A limited version is available free of charge. You can also purchase the full version from our stores.